Pressform Engineering has over 43 years experience in the design, development and manufacture of Refractory Anchors for high temperature furnaces and kilns. In 1978, Pressform developed the Rod Lock & Rota Lock Anchor and has, since then, manufactured and supplied close to 50 million anchors world-wide. We have worked with Australia’s leading companies in the cement, steel and petrochemical industries to develop and supply cost effective, industry-leading Refractory Anchors. 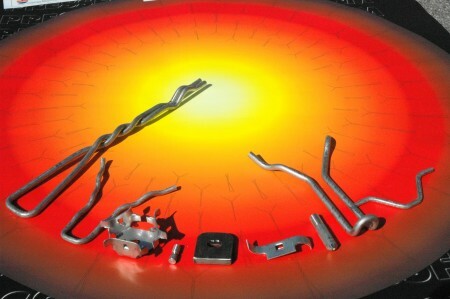 We believe experience and innovation is paramount and our specialist team has developed a unique, comprehensive offering of quality Refractory Anchors for almost any application. Pressform’s service and delivery is second to none with Refractory Anchors made to order in our extensive manufacturing facility, with our manufacturing team on call to allow for fast turnaround and delivery. Having our own manufacturing facility and expert team, lead by qualified Metallurgist John Worner, allows us to offer custom design and development to your specification, ensuring not only that your job is cost effective but that your product is efficiently designed with the correct metals and alloys to achieve the highly specialised task at hand. We also work in conjunction with customers to find solutions to existing refractory problems – we can provide investigation, reporting, recommendations and specialised product development. To find out more, view our video (above). With our extensive experience and in depth knowledge of our customer’s needs, we have developed the revolutionary Pressform Stud Welding System: a fast, efficient and fully transportable stud welding system for refractory anchor installation. Designed to save precious project time and allow you to work 1000 times faster. To find out more, view our video (above).